Title:- Complimentary-symmetry power amplifier and its DC analysis. Measurement of efficiency. Instruments & Components:- Power Supply, Multimeter ,power transistors(TIP122 & TIP127),resistors, function generator, CRO, connecting wires, Bread Board. Small signal amplifiers operate in the linear portion of the transfer characteristics which is very close to the Q point of the amplifier. Small signal amplifiers can be analyzed with the help of small signal h-parameters. Small signal amplifiers are also known as "voltage amplifiers". This is because these amplifiers are used primarily for voltage amplification but they are not capable of supplying a large power to the loads such as loud speakers. Whenever the load demands a large power, we have to use specially designed amplifiers called "power amplifiers". â€¢ Impedance matching with the load is necessary. â€¢ Power transistors are required to be used. â€¢ Power amplifiers are bulky. â€¢ Harmonic distortion is present in their output. â€¢ They are capable of handling a large power. Efficiency of power amplifier is defined as the ratio of output power to the input power. 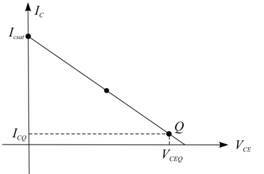 This classification has been done on the basis of position of Q point on the load line. In addition to these three, there are few more such as cross-over distortion. â€¢ The Q point of a class B amplifier is adjusted to be on the X-axis, i.e. the transistor is biased at cut-off. 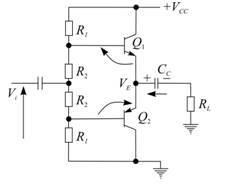 Due to this, a transistor can conduct only during the positive half cycle of the ac input signal. â€¢ That means the conduction takes place for only 180Â° or a half cycle period. Lot of distortion will therefore be present at the output. â€¢ Class B - Push pull amplifier. â€¢ Class B - Complementary symmetry amplifier. Let us discuss these circuits one by one. 2. Zero power dissipation under quiescent condition. 3. Impedance mulching with load is possible. 4. Second harmonic component gets automatically cancelled. 1. Cross over distortion is present in the output waveform. 2. Efficiency is not so high. It is important to have a small collector current under no signal condition. Otherwise, we can have cross over distortion. Suppose there is no bias at all applied to emitter junction. Then incoming ac signal has to rise about 0.7V to overcome barrier potential. Because of this, no collector current exists when the signal is less than 0.7V. The action of the other half cycle is complementary; the other transistor does not turn on until the ac input signal is more negative than 0.7V. For this reason, if no bias at all is applied to the emitter junction the output of a class B push pull amplifier looks like Figure 4.14. a. The output is distorted; it is no longer a sine wave because of the clipping action between half cycles. Since clipping occurs between the times one transistor goes off and the other comes on, we call it crossover distortion. To eliminate crossover distortion, we need to apply a small forward bias to each emitter diode. This means locating Q point slightly above cut off as shown. This is known as class AB operation. Complementary n-p-n and p-n-p transistors are used instead of using two of the same type. The single input signal is applied to both base inputs. A simple circuit is as shown. During positive half cycle Q1 is ON, and Q 2 is OFF. During the negative half cycle Q2 is ON, and Q1 is OFF. The operation of the circuit is push-pull with each transistor sending current to RL during alternate half cycles. 1) Connect the circuit as shown in fig. 3) Measure Idc on multimeter and Vop-p on CRO. 4) Calculate Pac, Pdc, Pd (per transistor) and % efficiency.